Today’s post is pretty epic! 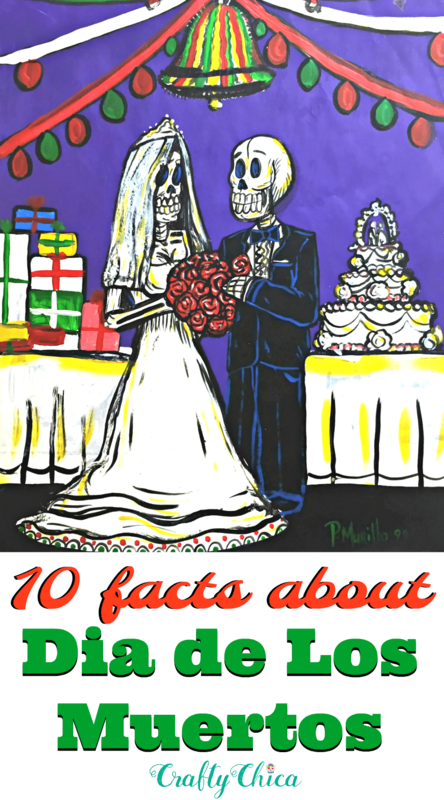 Not only am I sharing 10 facts about Day of the Dead (a.k.a. Dia de Los Muertos), but I also have some behind-the-scenes pictures from Disney Pixar’s Coco. Because my Day of the Dead content has spiked in traffic lately, I thought now would be a good time to remind everyone about the meaning and traditions of this very special Mexican holiday. And because I went on the press trip for Coco last month, I found out how much the filmmakers stayed true to the traditions, so I thought why not combine the two? I’ve only seen the first 35 minutes of Coco, but truly believe this is going to be an iconic film. I was among 26 bloggers chosen to sit for hours with the writers, producers, animators, director and hear the fine details of how this movie came to be. Okay, let’s start with our facts! 1. Day of the Dead has nothing to do with Halloween! That’s right! That’s the first thing to know and to tell others! 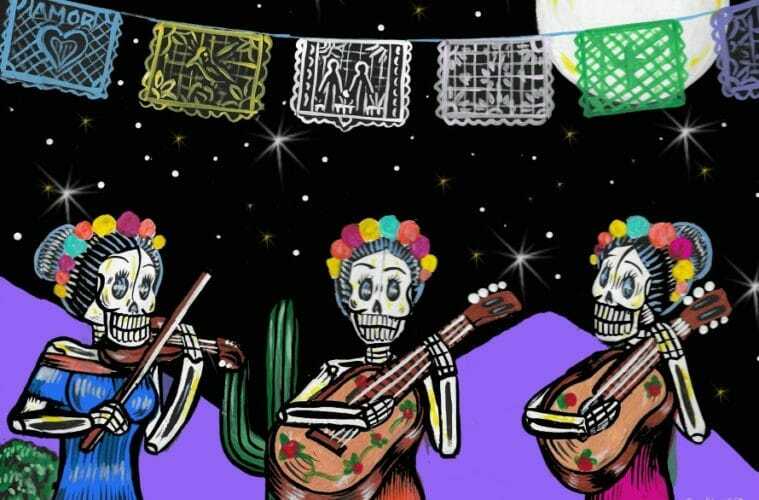 Dia de Los Muertos begins on November 1st at midnight and runs through November 2nd. Yes, both holidays are in the same season, but always make sure to differentiate between the two. It’s actually kind of disrespectful to wear/celebrate anything to with Day of the Dead on Halloween, or to incorporate the two. Day of the Dead is its own holiday. It’s about celebrating the cycle of life and honoring our ancestors, not dressing up in a costume or being scary. For Coco, not only is the film solely focused on events that happen around Day of the Dead, but even the movie release is far away from Halloween time. The filmmakers wanted to make sure it stood on its own, without any connection to October 31st. The film’s foundation is in family, so the release date is November 22, which is closer to Thanksgiving! 2. Day of the Dead face painting is to show we do not fear death. By painting our faces as calacas (skeletons), we are showing that we accept death as part of the cycle of life, we don’t fear that part of the journey because we will all be there at some point in time. The painted designs of a skull on our face shows Death that we are mocking it, but also showing respect. We hold the power because we are the ones who are alive, breathing, walking, taking charge of our lives here on earth. When you see the film, it’s explained within the land of the living in a very natural way. 3. 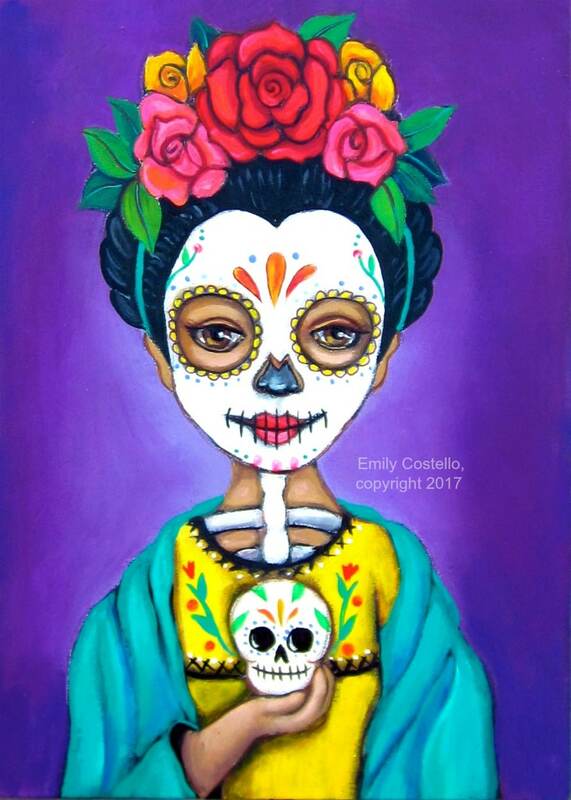 Day of the Dead is a time when the souls of the dead are invited back to the land of the living to reunite with loved ones. 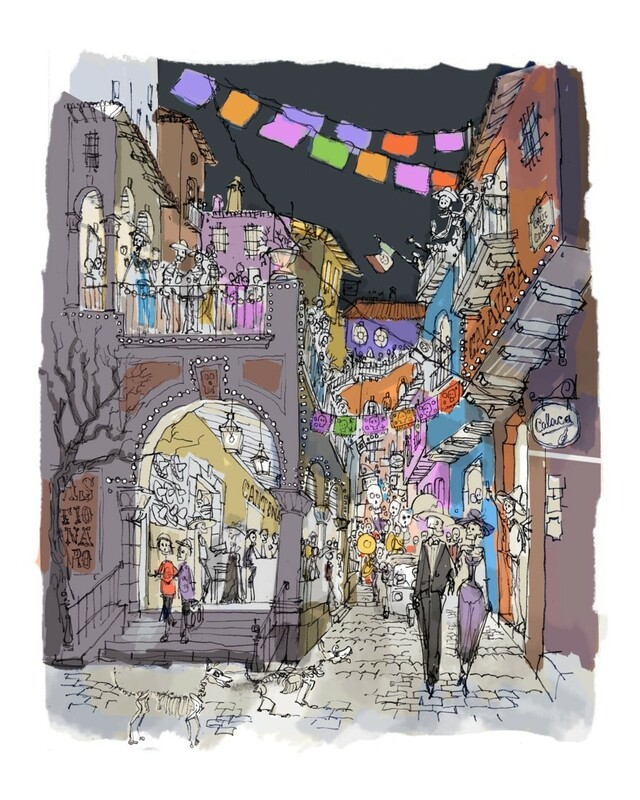 COCO – Concept art by Harley Jessup. ©2017 Disney•Pixar. All Rights Reserved. 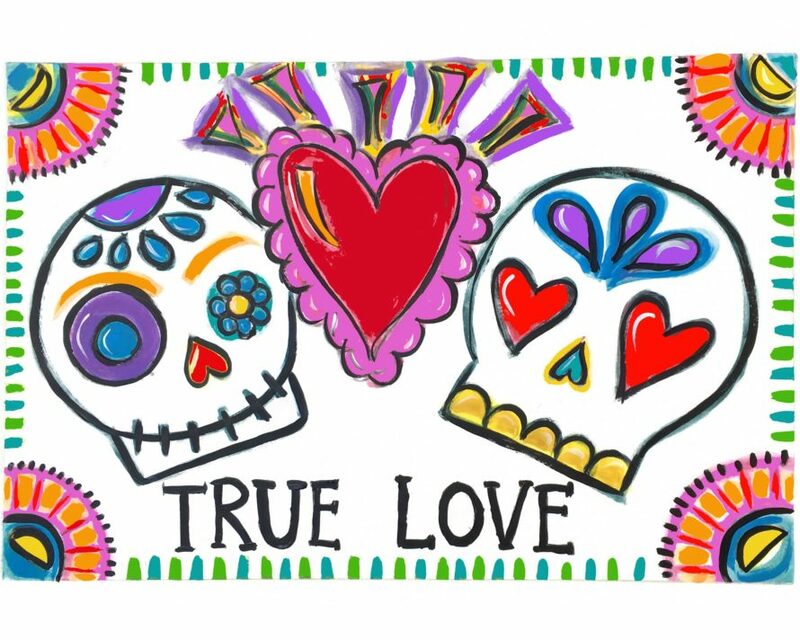 Dia de Los Muertos dates back 3,000 years! The first night, November 1st, is dedicated to the children who have passed on, and then November 2, is for the adults. It’s a strong way for the younger generation to learn about their elders who may have passed on. It’s a way to share those stories of our great-grandparents, grandparents, and so on. 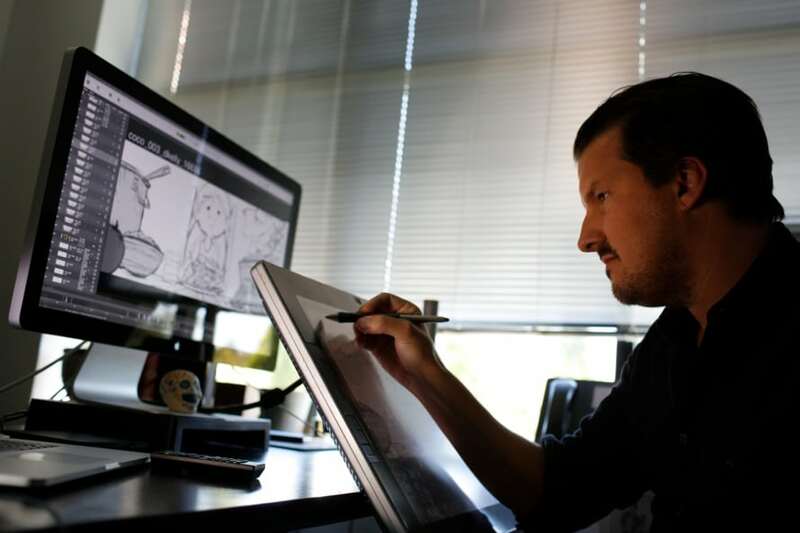 In the film, the main character, Miguel, learns this first hand. I’m not giving anything away, but I’m just gonna drop this photo below. Fabulous! 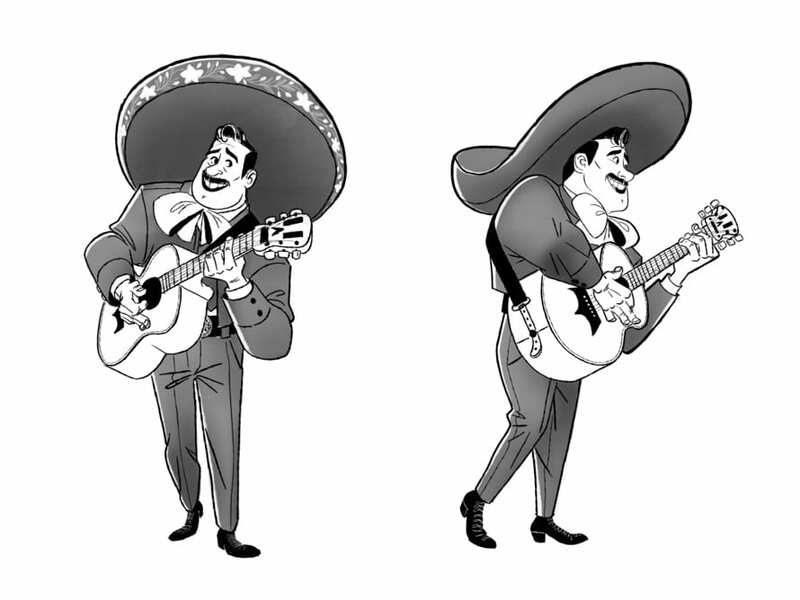 COCO – Ernesto de la Cruz concept art by Daniel Arriaga. ©2017 Disney•Pixar. All Rights Reserved. 4. An ofrenda is an important part of celebrating Dia de Los Muertos. An ofrenda is an assemblage you put together to honor a loved one. You’ll want to place their picture, their favorite foods, trinkets, hobbies, candles, sugar skulls, pan de muertos – and lots of beautiful colorful decorations. In Coco, oh my gosh, they have a HUGE family ofrenda that takes up a whole room. In Mexico, that is very common, whereas here in the United States, we have large scale community ofrendas down to simple ones on a nightstand. While it’s technically considered an altar of sorts, it’s not for worship. It’s for honoring, paying respect and remembering them! Start with a table as a base. The idea is to create three levels – the top represents Heaven, the middle (the table) living, and the bottom is the underworld. Place assorted sugar skulls around the base to represent a graveyard, add lots of marigolds and tealights. Place a glass of water on the table, with a plate of food. Add pan de muerto for sweetness, and even a shot of tequila or a cold beer of soda! Your guest will be thirsty and hungry after traveling from the afterlife to the land of the living! On the top layer, decorate it with colorful papel picado, and stand a picture of your loved one front and center, closest to Heaven! You can even decorate the frame if you are crafty like me, lol! Also, add some burning copal incense. And feel free to add more pictures if you want, it can be however you want to remember your loved ones, even if they are musicians, actors, people you never met. 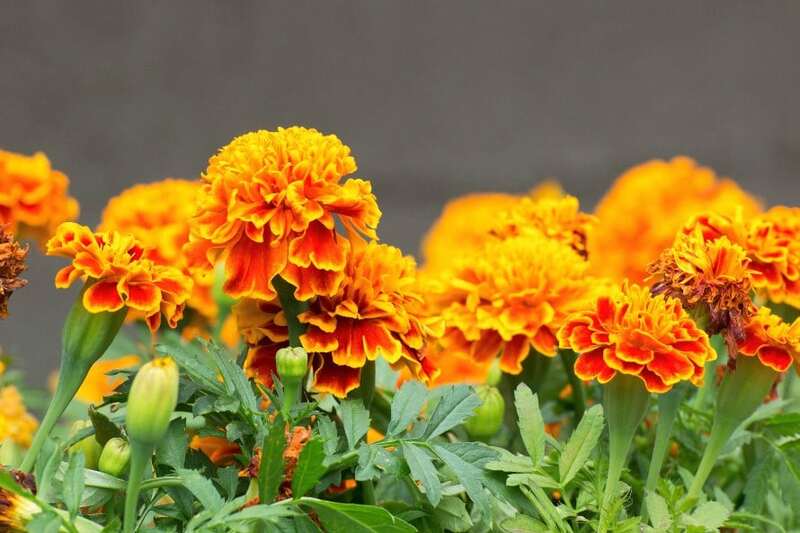 Marigolds, known as cempasúchil means “flower of the dead.” You’ll need lots and lots of them! The scent of the flowers lures the spirits home, and at the same time, the flower represents the fragility of life. If you don’t live near a nursery that sells them you can make your own using tissue paper. Here is a tutorial on how to make tissue paper marigolds! Copal – this incense is actually made from tree resin and dates back to the Aztecs. They believed the scent attracted spirits, and it also wards off evil spirits and helps to “cleanse the ofrenda” of any negativity. 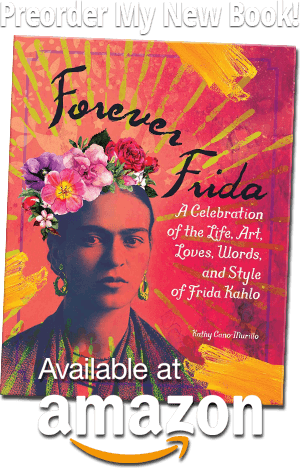 Decorations – Papel picado, decorated candles, photos, mementos, whatever they liked while they were alive. Food – Mole, pan de muertos, water, sweets., sugar skulls. Small mat in front of the altar for the dead to wipe their feet before they return home. Monoprint artwork by Kathy Cano-Murillo. 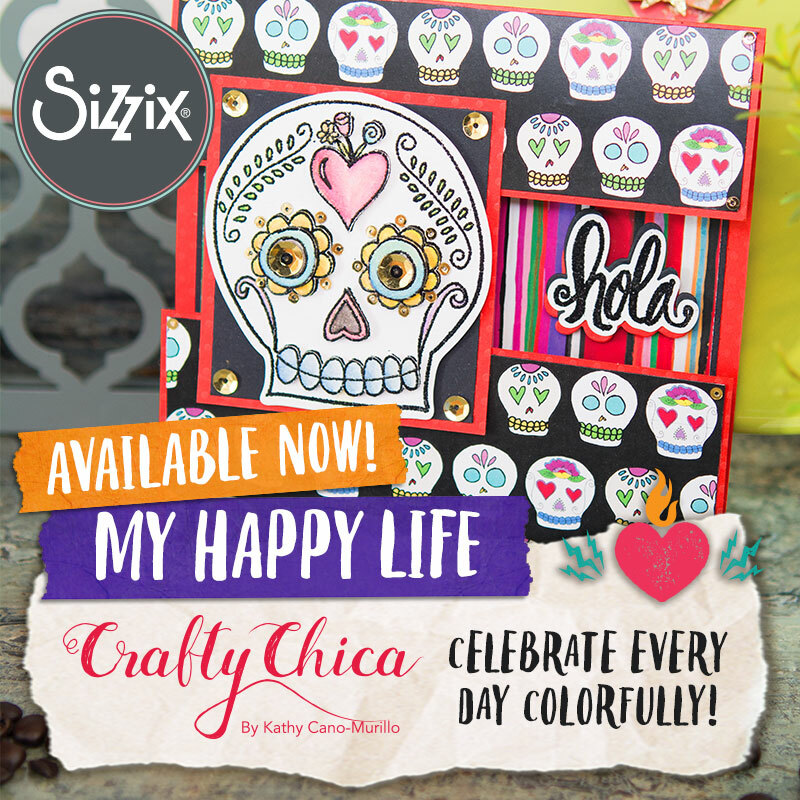 People are attracted to sugar skulls because they are bright and colorful. You’ll never see a scary sugar skull. The colorful royal icing represents the sweetness of life, as well as the sugar, and the skull represents death. To eat or just lick a sugar skull means you understand the combination of both. Both are to be represented and honored. The skulls came about by the Aztecs who collected and placed them as trophies to represent death and rebirth. 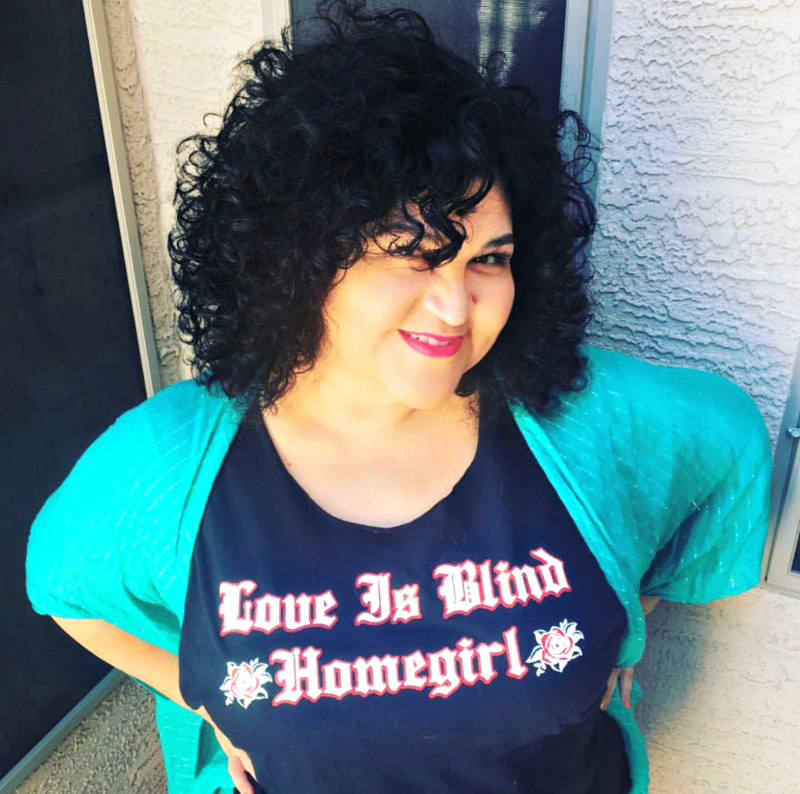 Calaveras are whimsical songs written and sung to our loved ones who passed on. They can also come in the form of poems, comics and illustrations. In Coco, you’ll be amazed at all the music and Calavera-inspired tunes! The producers found street performers and hired them to recreate their calaveras for the film! 8. Day of the Dead is also celebrated at the cemetery. While it’s common to set up an ofrenda in your house, it’s also a wonderful thing to visit and decorate a gravesite of a loved one. You can build the ofrenda there, with all of the same elements. 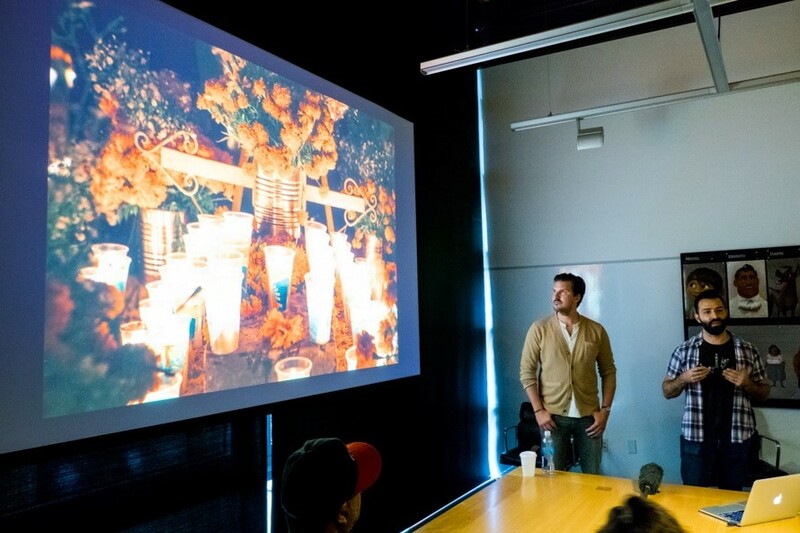 You can see in the picture above, the filmmakers talked about their visit to Mexico during Dia de Los Muertos and the time they spent at the graveyard. They translated that into the film. You’ll see the graveyard covered with bright orange marigolds, foods, mariachis – it’s like a fiesta for everyone to join in! 9. Even with all of this, it’s about making it your own! Use the basics I mentioned above to create your own special celebration of Dia de Los Muertos. Research deeper, find your connection, no matter what culture you come from, find out who your ancestors were and celebrate their lives. One thing about the film’s story – if a spirit’s family didn’t place their picture on an ofrenda for Dia de Los Muertos, that spirit cannot cross over into the Land of the Living. It’s heartbreaking because to them, they feel forgotten. And again, it doesn’t even have to be a relative, it can be someone who inspired you! 10. 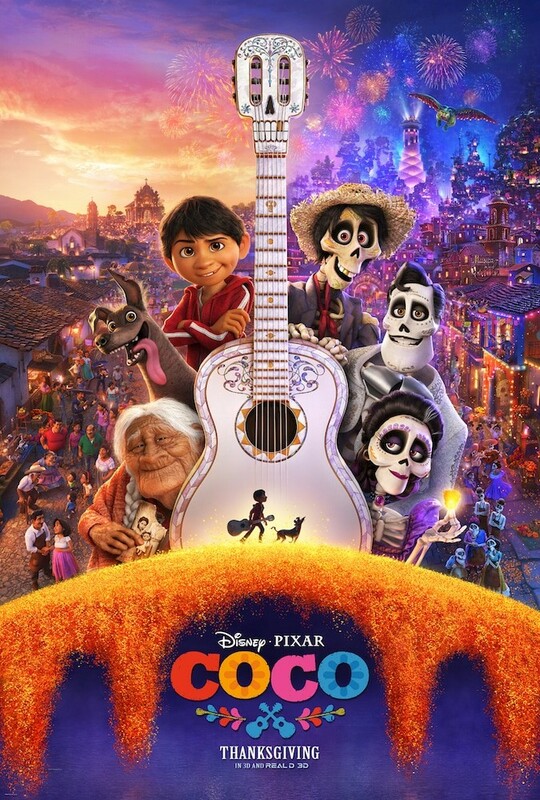 Check out the new trailer for Coco! Okay, it’s not exactly a “fact” but I’m sure the movie will be after it releases on November 22!